The Black Mamba gets its name not from the color of its scales, but the color of the inside of its mouth. 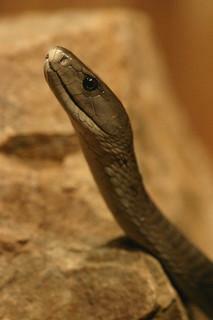 The outside of the Black Mamba is a greenish- brown, while the inside of the mouth is a striking black. The Black Mamba is one of the longest snakes in the world. It can reach up to 14 feet in length! 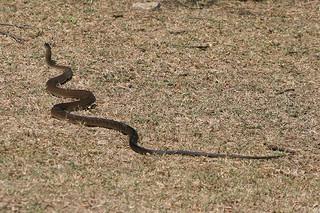 Despite its length, it tends to be a relatively thin snake, only weighing around three and a half pounds. The Black Mamba can reach speeds of up to 12 miles/hour! That's faster than most humans can run! More information can be found on the Black Mamba, here.